The curiously punctuated M.ill.ion were one of those bands I'd been aware of for ages, having seen reviews and features in the metal press a decade and a half earlier (back when we still had a metal press). But I'd never heard them before tonight. Which is a shame, as they were actually pretty good. Competent musicianship and decent songwriting combined to leave a positive impression. On to M.S.G., then. Last time I'd tried to see Schenker, he'd fallen out with his U.F.O. bandmates, and the tour was cancelled after only a couple of shows. This time, though, he actually made it to the stage, albeit looking old and frail. But the apparent frailty didn't last long, and once he started playing, he seemed to be enjoying the show. He's surrounded himself with a bunch of stellar musicians, and they reeled out a set of classics, from "Lights out", through to "Attack of the mad axeman", via "Only you can rock me" and "Are you ready to rock". The U.F.O. songs were conspicuously better than when U.F.O. 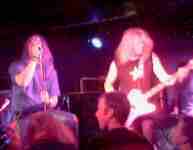 performed them without Schenker at The Astoria earlier in the year. Although rumoured to be featuring 3 vocalists tonight, Gary Barden didn't show up, but Leif Sundin and Jari were more than able to stand their own, with Leif being particularly impressive. A couple of encores brought "Doctor, doctor" and "Rock bottom" to round out the evening. Although I would have liked to have heard some McAuley era material, it's hard to fault an excellent evening like this. Hurricane party had played here a mere 10 days earlier when they supported W.A.S.P., and I'd been impressed with their improvment since when I first saw them. Tonight continued that trend with another strong show, and their best showing yet that I've seen. I'd last seen Europe 15 years earlier at the height of their popularity. Now reformed, and with a new album, I wasn't entirely sure what to expect. The new album was better than I was expecting, but perhaps not quite up to their earlier standards. The first thing to strike me was that they had something you don't tend to see much any more -- a backline! In years gone by, every band used to have piles of amps and speaker stacks behind the band, but it's a rare sight these days. But that wasn't all. They had a prodigious number of lights, and pyros throughout the set, probably more of both than I've ever seen anywhere outside of a Rammstein gig. Perhaps they'd thrown everything into tonight because not only was this they're only UK show, but they were also filming the show for a forthcoming DVD. But whatever the reason, it was most welcome. 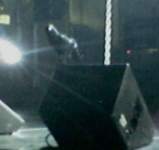 The set itself was a mix of classic tracks and a selection from the new album. Highlights for me were "Superstitious", "Rock the night" and an unplugged version of "Carrie", which basically consisted of Joey Tempest playing an acoustic guitar, and letting the crowd do the singing. 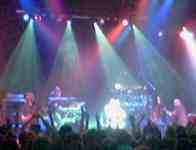 The encore brought the title track from the new album, "Start from the dark" and "Cherokee". Then the lights went down, and the synth began the opening to the song everyone had been waiting for: "The final countdown". The perfect ending to a great evening. I'd seen Hurricane Party before when they supported Queensrÿche last year. Then, they came across as almost a novelty act. What a difference a year makes. This time around, there was much more substance to them. Better stagecraft, and although many of the songs were the same, this time they were performed with much more intesity, and came across very well. A massive and welcome improvement. When they were here earlier in the year in support of "The Neon God, part 1", W.A.S.P. put on a pretty decent performance. But it wasn't a great one. 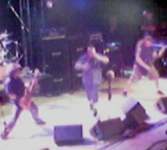 This time they were touring in support of part 2, and they put on another strong performance, opening with "Helldorado", and continuing with a range of tracks from both past and current albums. For the smearing of UV paint, "Tortured eyes" had been replaced with "Kill your pretty face", which was a big improvement. Once again, if I had a criticism, it would be that their mid period was overlooked, and it really has more than enough strong material to stand its own. Tonight, though, the sound was better than last time, the band seemed more enthusiastic, and the whole thing came across better. Highlights for me tonight were "I wanna be somebody", "L.O.V.E. machine" and once again, an excellent rendition of "The idol". So this wasn't exactly the gig I'd expected it to be. 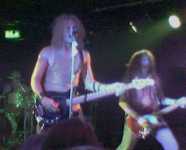 After seeing them at Bloodstock, I was looking forward to NNTG. But their 7:45 stage time came and went, and the band were nowhere to be seen. Claire from Invey came over and told me that the singer was stuck in traffic, and hadn't been able to get to the gig. Various options were being discussed, including the band going on and performing instrumentals, or with one of the others singing, but they weren't too keen on that idea. They also tried to get their slot swapped with one of the other bands on the bill, but to no avail. 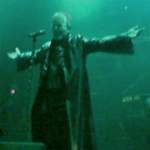 Eventually, though, the singer arrived, and Vince from Bloodstock rushed out to park his car, while he ran to the venue to start the gig. By this time, they were nearly all the way through their allotted time slot, and although I suspect they were granted a little leeway, they were still only going to be able to play a much reduced set. Musically, they were great, giving it their all, but the short slot only gave time for 4 songs, and just didn't give them enough time to show their quality. Supersonica were a guitar based pop band, and not a particularly good one at that. 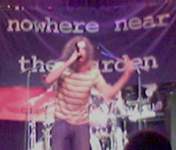 They were followed by a band called Eddiefink, who didn't look promising, taking to the stage in suits, so at that point I called it a night and left. It's a shame NNTG didn't get to play a full set, but I'll go and see them again next time. John Young has been a keyboard player for Asia, and has toured with Uli John Roth, The Scorpions and a whole host of other bands. But I'd never really heard of him before tonight, where he appeared as a solo keyboardist playing along to a backing track. He was certainly competent enough, but not particularly engaging, and spent much of his stage time lamenting the poor state of the live music industry in the UK and the decline of prog rock. He might be a more interesting proposition with a full backing band. Magnum opened with some flash bang pyros introducing "All England's eyes". 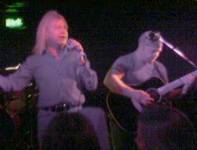 Bob Catley, in a dazzlingly white shirt, was perhaps even more of his guppy self than usual. But however cringeworthy his stage antics may be, he's got a great voice, and consistently puts on a good show. Tonight was no exception. If there was a complaint, it would be a lack of material from the earlier albums. That's only a minor niggle, however, and the tracks they played from the new album were refreshingly good. Highlights were "How far Jerusalem" and traditional set closer "One sacred hour". I was surprised not to hear "The spirit", though. This was the first time I'd been to Ocean, and was surprised to find a pretty decent venue. It's just a shame it's in the arse end of nowhere, and is such a pain to get to. I'd never heard Pro-jekt before, but from what I'd read, I was expecting them to be a cyber nu metal Kerrang! type band. So it was a pleasant surprise to find a quite reasonable goth industrial metal band -- for want of a better phrase. They didn't really fit into either of those categories, but had elements of all three, at times heading firmly into synth driven electronica territory, at others having crunchy guitars and solid bass dominating the sound. The crow on the monitor was a nice touch, and I enjoyed their set. One to watch out for in the future. 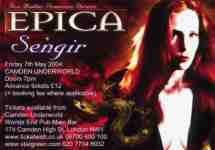 The only thing I knew about Susperia was that they were formed by Tjodalv when he left Dimmu Borgir. Musically, there was some similarity between the two, but (and this may sound strange) the vocals were less accessible than Dimmu Borgir, despite being cleaner, and the music didn't have quite as much of an aggressive feel to it. That said, they still put on a very respectable set, and although I wasn't familiar with their studio output, I still enjoyed the set. As an encore, they played a cover of A-ha's "The sun always shines on TV". Which was a good prompt for the guy next to me to make me feel old by asking me what it was, as he didn't recognize it. I hadn't really heard much from Mortiis since his first album. Tonight's show was a reasonably competent show of industrial metal. Partway through the set, he declared that it was time to sacrifice an ear, and tore it off to throw into the audience. I have a couple of gripes though. Firstly I felt the songs were too repetitive, and by the end of the set, I was getting distinctly bored. Secondly, I think all three bands suffered a bit from the size of the crowd compared to the venue size. For the number of people that turned up, The Underworld would have been a more appropriate venue, and would probably have generated more of a buzz in the crowd. I'd arrived at the venue too late to catch the first band of the day, Rezin 69. Intense were thus the first band I saw on the Saturday. I haven't been overly impressed when I've seen them before, and although they're definitely getting more professional over time, I still feel that the vocals just aren't good enough to compliment the music, and until that situation changes, they're always going to be less than they could, and perhaps should, be. Still, a reasonable showing nonetheless. In the Darwin Suite, Seven Years Dead were a taste of something a bit heavier, playing a traditional brand of thrash. The vocals sounded a bit flat in a live environment, though, and the band didn't do much for me. I'd be interested to see if a studio setting would give an improvement though, as there's certainly some potential. Panic Cell had garnered quite a large following on the main stage. I'm not entirely sure why, though. Although they were quite popular with the crowd, to me they came across as an average pub rock band, and were a bit bland. Humanity were another band that didn't do anything particularly wrong, but did nothing to stand out from the rest either. They did show a marked improvement on a song introduced as "Serenity", though. I'd been looking forward to seeing Edenbridge, as I'd been quite impressed with their studio output. Again, although I enjoyed the set, they did little to make it a truly memorable one, and a lot of their songs came across sounding very similar to each other. 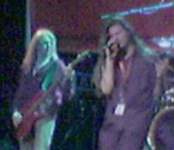 Two exceptions to that were their renditions of "Wild chase" and "Cheyenne spirit", both of which were head and shoulders above the other material they played. I'd have liked to have seen "Sunrise in Eden", though. I'd heard a lot of bad things about Nowhere Near The Garden before the weekend, and several people had complained that they weren't the style of music that should be playing at a festival like Bloodstock. So I was somewhat surprised when my low expectations were easily surpassed by what turned out to be quite a decent band. True, it's not a style that I'm particularly into, reminding me of bands like Finger 11. But they had strong musicianship, a great stage presence, and a frontman who did a great job of performing to the crowd, even if he hasn't managed to buy a pair of jeans that come up to his waist yet. They put on a good enough performance that I'd definitely go and see them again on their own should they be playing in London. 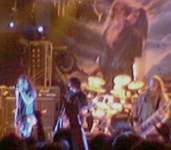 Evergrey were the first of the big name bands. They have obviously been doing this for a while now, and came across as extremely professional, and put on a great set of technical metal, which went down very well with the crowd. They come across significantly heavier on stage than they do in the studio, too, and that seems to work well for them. The highlight for me was probably an excellent "A touch of blessing". Next up in the Darwin Suite, Gutworm were playing their warp speed death metal. The vocals were too incomprehensible for me, though, and I just didn't enjoy their set at all. They had an inexplicably large crowd, though, far larger than some of the more deserving bands on the bill. 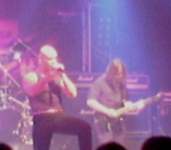 Balance Of Power have recruited a new vocalist since they last played at Bloodstock in 2002. This has been a big improvement for them, and they're a better band now than they were then. They are still a bit too bland and progressive for my tastes, though. I'd like to see them move in a heavier direction. 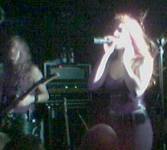 The Prophecy were very melodic, with some Maiden-esque tempo changes mid-song. As is becoming common these days, they alternative clean and harsh vocals. However, I think they haven't struck the balance right, and they're not using enough clean vocals to provide variety to their sound. So on to Primal Fear. 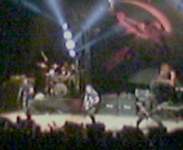 Having stolen the show at Bloodstock '01, I'd gone out of my way to see them again, but the next two shows of theirs I saw hadn't lived up to their original promise. Furthermore, their two most recent albums haven't been quite up to the standards they set with their earlier output. So it was with mixed expectations that I waited to see them. Wow. I needn't have worried. This was a textbook demonstration of how to play heavy metal to an audience. Wisely opening with the awesome "Angel in black", they stormed through a set of classics. Although Ralf claimed they had 5 albums worth of material to get through, they concentrated on songs from only 3, with only "Final embrace" making the set list from "Jaws of death", and nothing from "Black sun". The highlights for me were "Nuclear fire", "The healer" and "Metal is forever". Even some minor sound problems resulting in Stefan's guitar being way too low in the mix didn't affect the enjoyment of a stunning performance from start to end, that I didn't want to finish. Cruachan were an enjoyable, but odd mix of celtic folk and metal, with electric instruments and a selection of traditional celtic ones. Sporting both male and female vocals, harsh and clean, they reminded me in places of various bands such as Clannad, Gary Moore, Inkubus Sukkubus and Steeleye Span. Highlights for me were "Brian Boru", and "Ride on", which although I'd never heard of it before was apparently a hit single for them. An awful lot of people were looking forward to Sonata Arctica in the main hall. 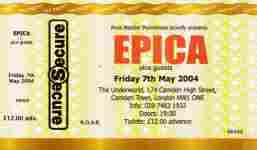 It was a big disappointment, then, when they were essentially crippled by sound problems. Although they were going through the motions on stage, the guitars and backing vocals were literally silent through the PA, and the keyboards could barely be heard, being drowned out by the bass and drums. Vocalist Tony Kakko was visibly upset by this, and spent the first few songs heading over the to mixing desk and furiously trying to get the problems sorted out. Over the course of the set, the sound did definitely improve, but I'd say well over 50% of the set was marred by the sound quality. That's not to say the set wasn't without its highlights, which for me were "Still loving you" and "Replica". But the band obviously weren't enjoying it, and although they were trying their hardest, the sound problems definitely spoiled their set for me. Fourway Kill had a large crowd, but as when I saw them supporting Blaze, they simply proved that they are great exponents of making a lot of volume. There was simply too much noise and not enough substance or songwriting skills to sustain my interest. They also had by far the worst pit fiends of any of the bands at the festival. The security guards were standing and watching in amazement as they beat each other up while ruining the set for those who were trying to watch the band. Children Of Bodom have parted ways with their previous guitarist. This opening was thus filled by Alexi's partner in crime in Sinergy, Roope Latvala. The two of them are extremely technically competent, and together they have the potential to rival some of the great twin lead guitar pairings. I've always felt that they've been let down by Alexi's Dani Filth like vocals, though, and tonight was no exception, that being my only real complaint. Highlights of the set were "Every time I die", and an excellent "Angels never kill". 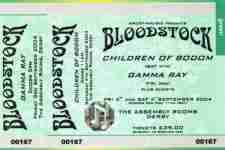 Another Bloodstock over, then, and this time I managed to see all but two of the bands playing over the weekend. Of the 25 bands, only Invey, Gutworm and Fourway Kill produced substandard performances. The rest were all good and came up trumps with strong showings. Honourable mentions must go to Season's End and Nowhere Near The Garden, neither of whom I'd heard before, and who both put on strong performances. 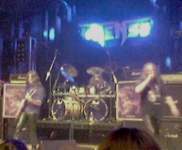 Of the big name bands, Sinergy and Evergrey led the way. But at the end of the weekend, it was clear that Primal Fear were simply in a different league to the everyone else, and easily took the honours of my band of the festival. Come back to the UK soon, guys! Not the best start to a gig. I'd been at the Bulldog Bash earlier in the day, and had planned to ride into London for the gig, and park in my office car park, which is conveniently located a couple of minutes' walk from The Astoria. But a combination of me leaving slightly late, encountering traffic on the way meant I was running late by the time I got there. Then I found out that they'd closed the road to my office, and spent more time trying to find out how to get around to the back so I could get to the car park. When I eventually made it into the gig, I'd missed Viking Skull, which I'd anticipated, and also most of Dio's set, which due to the delayed release of his new album was effectively a greatest hits showcase. Still, what I did see showed him to have lost none of his stage presence, and once again he put on a great show, with "The last in line" and "Rainbow in the dark" particularly standing out. Viking Skull have sadly failed to live up to their appearance at The Monarch where I first saw them, and have been very mediocre when I've seen them since, and tonight was no exception to that. Alice Cooper had a much more minimalist stage set than at his other recent shows. Sure, there was still the sword with the dollar bills, and the balloons full of confetti, but gone were the props from a horror movie, and the show didn't even feature an execution of Alice! He put on a reasonable performance, but it did seem a bit lacklustre. Notable tracks were "Hello hooray" and "Under my wheels", and "Desperado", for which he donned a Spanish style hat. But he's been much better in the past, and I hope he returns to his previous good form next time he plays in the UK. Heart have been around for donkey's years, but have barely been heard of since their hits of the late '80s. Rumours had been going around that Ann had been doing a solo country and western album. Consequently, I had no idea what they were going to be like. I'd passed up a chance to see Queensrÿche on the same night as it clashed with this, and I've seen Queensrÿche many times. Was it going to be a mistake? Fortunately not, they turned out to be rather good. Highlights for me were "Magic man" and an acoustic version of "Alone". For the encore, they performed a couple of Led Zep covers, "Black dog" and "Misty mountain hop". Symphony Of Pain were uninspiring, and I don't remember much about them. Bob Catley was once more lacking a backing band, opting to use just a single guitarist instead, and once more he put on a pretty decent performance. Nothing special, but quite enjoyable nonetheless. I knew of Jeff Scott Soto from being the vocalist on Yngwie J. Malmsteen's first two albums. After that, he went on to play in Talisman and Eye (that I know of), and other things besides. One of those other things has apparently been appearing at Queen conventions, a fact reflected in his performing a cover of "Dragon attack". Although I was mostly unfamiliar with his music, it's obvious he's been doing this for a long time, and is a very accomplished frontman. His solo material is good enough to stand on its own merits, but it was his medley of Malmsteen songs that stood out for me, with an excellent rendition of "I am a viking" deserving particular mention. Throughout the set, and particularly in the encore, he played various covers, some mere snippets, and some whole songs. Apart from the aforementioned "Dragon attack", there were (that I could identify and can remember) "Staying alive", "Purple rain", "Play that funky music", "Enter sandman", "Kung fu fighting", "Red hot", "Crazy train", "Layla" and "Smoke on the water". I'm sure there were many more that I've missed, too. A great evening's entertainment. I'd never heard Sengir before, but since they were playing at the Female Voices festival with Nightwish, Epica and Flowing Tears, I had a fair idea of what to expect. Musically, they were pretty reasonable. But sadly they were horribly let down by the vocals. Ellen's voice itself is fine, but she was constantly singing flat, and for someone with as little musical talent as me to be able to notice, that's saying something. Epica, on the other hand, were everything I could have hoped for. Living up to their name, they put on a near faultless show of epic power metal. As seems to happen to quite a few bands these days, they seemed genuinely surprised by the crowd response. The UK (probably due to the likes of Kerrang!) has got a reputation of being hostile to this sort of music. In reality, the exact opposite is true. The audiences may not be as large as in continental Europe, but the intensity is just as high. No doubt helped by the response from the crowd, he band were obviously enjoying themselves, and that in turn merely served to spur them on to even greater things. If I had any criticism of the album, it would probably be that it felt a bit watered down in place. In a live setting, though, the tracks had all the energy and punch you could hope for. Highlights for me were "Sensorium" and "Cry for the moon". I will definitely be going to see them when they return to the UK. An excellent performance. No ticket for this one, it was just a case of turning up at the door, and hoping I got there early enough. I was somewhat concerned, then, when the traffic was solid for most of the way, and I arrived some while after the doors had opened. Fortunately, I was still just about early enough to get in. First band up were Desolation. I hadn't heard of them before, but they launched into quite a presentable melodic death metal set, albeit one not without technical problems. As the vocalist said, when you lose one guitar during a song, it's a bit worrying. When you get to the third one, it's time to stop the song and fix the guitar problems. But a decent enough showing, nonetheless. John Slater had left Blaze a few days before this gig for personal reasons (although he expects to rejoin them at some point soon, apparently). His replacement was Doro guitarist Oliver Palotai, who filled his shoes quite nicely, albeit without as much stage presence as I'd have liked. Blaze himself was sporting a beard, and looking disturbingly like some mutant cross between Charlie Andrews and Geoff Capes. But that didn't affect the performance, which once again was outstanding. Of all the bands I've seen, Blaze are the ones that most consistently deliver the goods in a live setting. Tonight's show was my first exposure to the new material on "Blood and belief", which sounds quite promising, even if it's not earth shattering. Another great showing from Blaze. No support, just Kraftwerk. They were actually playing two gigs tonight in the same venue, one after the other. I went to the earlier of the two. The show opened to a projection of the band onto the stage curtain, which was then withdrawn to reveal the four of them, immaculately suited, each with a keyboard and laptop. Obviously, they had to rely on visuals to make an interesting show, and these were supplied in the form of projection screens behind the band. Opener "The man-machine" came with stark words displayed as if by early 1980s 8-bit computer. From there we moved to a 3D wireframe model and then onto some actual video footage. I'd forgotten how obsessed the band were with cycling, and the Tour De France in particular, a theme which was repeated several times throughout the evening. For the first of several encores, the curtain withdrew to reveal four robots in place of the band, who unsurprisingly performed "The robots". For the final encore, the band came out wearing suits with UV sensitive wire mesh frames to mimic the scenes being projected behind them. I won't be rushing out to religiously see the band every time they tour, but it was en enjoyable night; definitely a spectacle to experience, and I'm glad I went. Infrasound were quite unmemorable. 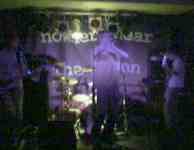 Tuneless noise, and although the audience seemed to quite like them, they just left me cold. HIM had only played in London a couple of months earlier, so it was a bit of a surprise to see them back again so soon. They got off to an amazing start, from opening with "Wicked game", through the next three or four tracks. Had they kept up the same standard for the rest of the set, they'd be heading for a 5 star review. Sadly, though, they lost their initial momentum, and while I enjoyed the evening, it could have been so much better had it lived up to its early promise. Events had conspired against me to ensure that I arrived late for this gig. The Voice had apparently cancelled for technical reasons, so in the end, I only missed one band, Automation. Thus for me, the first band of the evening where Voices Of Masada, who played a quite presentable trad goth set. Although I don't have a record of having seen them before, there's something familiar about them. I wonder if I've seen the band members in previous bands. Next up were Surefire. I'm not entirely sure what they were doing here. They were completely out of place on a goth bill, like this, being the only ones in the entire place not wearing black, and playing what I guess would be described as '70s rock. But they were actually very, very good, and the singer in particular has a great voice. I'll be looking out for them in the future. Brother Orchid started well, again playing vaguely traditional goth, but with a harder edge and crunchy guitars. Normally this would appeal to me, but their set seemed to tail off and not really go anywhere. Finally came headliners The Faces Of Sarah. Gone since the last time I saw them are Craig and Issy, and gone also is Craig's replacement, Chris. But none of that mattered, and the band were once more on top form, with Nick sounding as good as ever. The band just seem to be getting better and better with time, and indeed the new material was very strong. They're one of the most underrated bands of the moment.